Why an IDE? Let there be no mistake, I still love BBEdit and TextMate. I use both daily at work and at home for quick edits and I actually wrote this post in TextMate. But if you spend a good portion of your day writing PHP, an IDE will save you time in small increments by highlighting those unbalanced braces and missing semicolons, displaying PHP function arguments, and allowing you to debug your code right in the editor. There are commercial IDEs available and I've use a few of them. 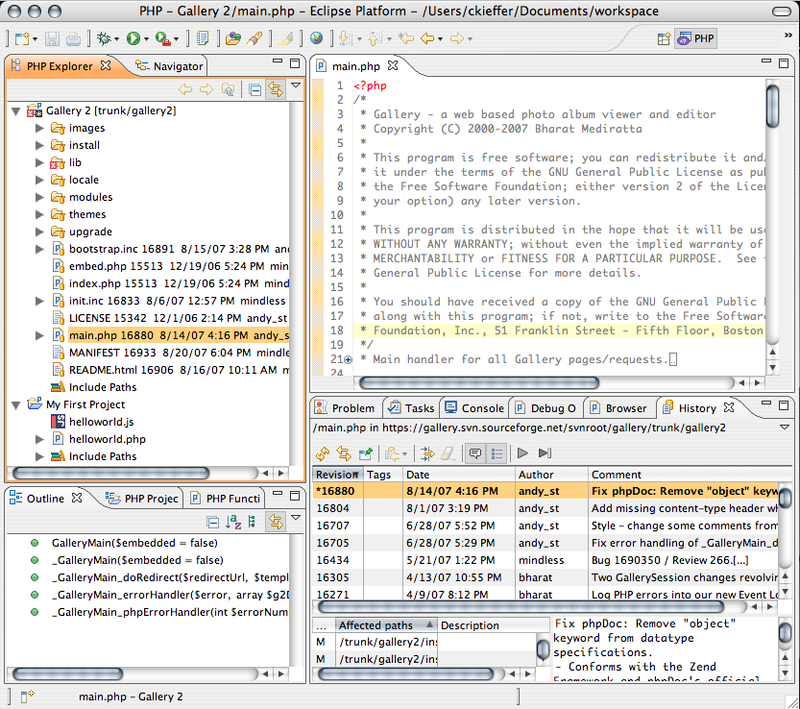 I tried an early version of Eclipse with the xored studio but the combo wasn't feature-rich and didn't perform as well as Zend Studio. I later switched from Zend to Active State's Komodo. I've been happy Komodo but it's sluggish performance on my PPC Mac drove me back to giving Eclipse another try. 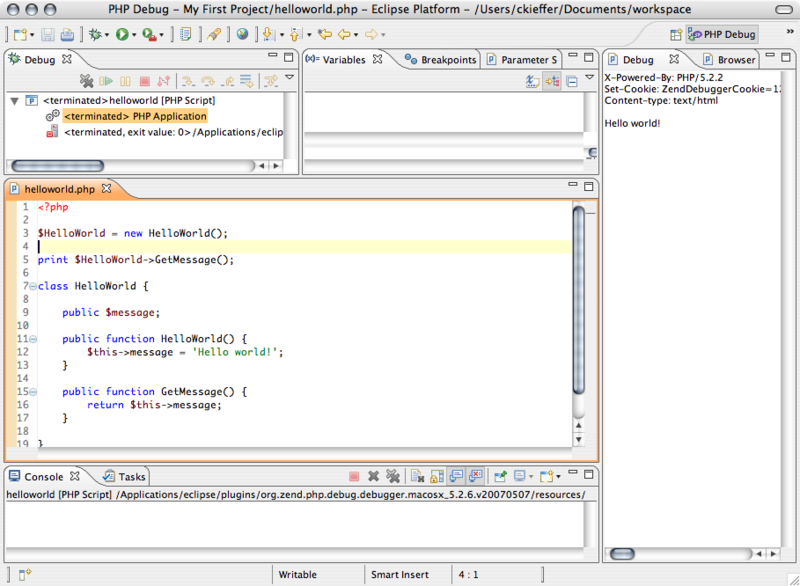 I started using Eclipse with PDT at work about a year and am amazed at how much PDT, formerly PHP IDE, has improved over the past four years. Eclipse is first a Java development environment, but extensions exist for a bunch of other languages, including Perl, Ruby, and Tcl. Okay, enough with the commentary, let's get to it, shall we? Installation couldn't be easier. Visit the Eclipse PDT download page, select a stable build link, scroll down to the PDT All-in-One section, and select the download for your platform. http://download.eclipse.org/tools/pdt/downloads/ Once the download is complete, unpack and move the 'eclipse' folder to your Applications or Program Files folder. 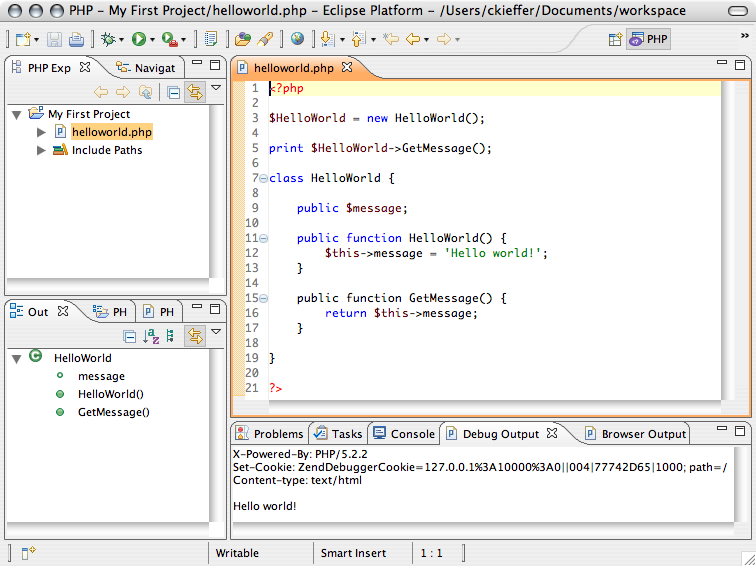 Fire up Eclipse, create a new PHP file or project, and code away.